The use of trekking umbrellas out on the trail is has garnered a fair bit of debate in recent years with some folk who swear by them and others who consider them completely unnecessary. I probably fall somewhere in between and often bring one along for day hikes if the weather looks a bit dodgy. Let’s look at some reasons why they have become a bit of a game changer. Firstly, they are lightweight. The Montbell U.L. trekking umbrella reviewed here comes in a feathery 165 grams including the sleeve case. 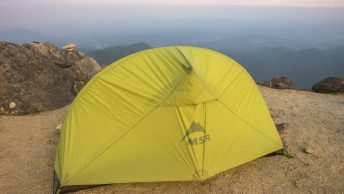 While some are a fraction lighter such as the Snow Peak ultra-light umbrella (133g), issues regarding structure and stability start to factor in. Secondly, in patchy rain they can be quickly put up without the hassle of zipping up your waterproofs. Finally, they are an ideal companion in hot and open terrain such as high mountain ridges or desert plains where sunburn and heatstroke are a real threat. On the downside they can catch on and potential rip with vegetation and rocks, cause hand/arm fatigue, obviously don’t provide much in the way of insulation and are pretty much redundant in heavy winds. Moving onto the Montbell U.L. trekking umbrella. The most noticeable feature of the umbrella is just how lightweight and compactable it is. The ultra-thin nylon fibres are tightly woven which has the two fold advantage of being incredibly thin while maintaining impressive tear strength. The 15-denier Ballistic Airlight nylon has high wind resistance performance and a soft texture. The nylon has very good abrasion resistance through a manufacturing process that heats, stretches better interweaves the fabric. In the wet the nylon water column also has excellent water repellence. The umbrella can be set up quickly, though like most telescopic umbrellas does require outwardly folding each of the eight pivot hinges. It opens and closes with a push up and down which means no more pinched fingers. One feature which is omitted is an adjustable wrist loop which some hikers prefer to help maintain a safe and comfortable grip. Due to the umbrella’s lightweight construction its not recommended for use in windy conditions and it’s modest canopy size limits rain protection. This affordable, compact and lightweight hiking umbrella meets most performance standards and is a nice supplement to your regular wet weather gear.